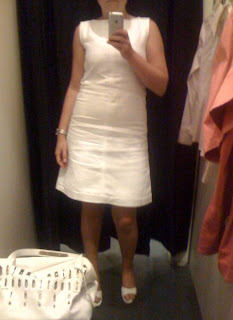 A few days ago I received a package from laredoute.fr containing a white dress from the collection Courreges did for the French retailer a while back (in 2007 to be exact, and I bought it extra cheap from the Outlet section of the site). It is completely white, but at the back it has a row of red buttons from neck to bottom. I matched it with white slides and bag, and only after a while, in the afternoon, when strolling around some shops, it stroked me: I have the perfect nurse outfit!! Btw, did you know that Andre Courreges invented the mini skirt in 1964?